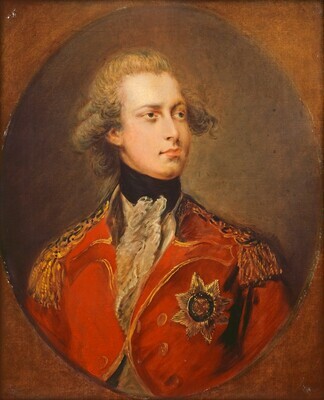 Painted for the sitter, who presented it to James, 2nd earl of Courtown [1731-1810], County Wexford [Ireland], Treasurer of the Household and Lord of the Bedchamber to the Prince of Wales; by descent to James, 5th earl of Courtown [1823-1914], County Wexford. (Asher Wertheimer, London); sold September 1916 to (M. Knoedler & Co., London); sold October 196 to (Henry Reinhardt & Son, New York). John N. Willys [1873-1935], Toledo, Ohio. (M. Knoedler & Co., New York); purchased January 1918 by Andrew W. Mellon, Pittsburgh and Washington, D.C.; deeded December 1934 to The A.W. Mellon Educational and Charitable Trust, Pittsburgh; gift 1937 to NGA. Georgian Papers 26791, Royal Archives, Windsor Castle, under the year 1781: "A Head of His R:H: [Royal Highness] delivered by orders to Lady Courtown" at 31 pounds, 10 shillings; one of four portrait heads of the prince by Thomas Gainsborough given to friends by the sitter. Oliver Millar brought the passage to the Gallery's attention in a letter of 11 March 1964 to John Walker, NGA director (in NGA curatorial files). M. Knoedler & Co. Records, accession number 2012.M.54, Research Library, Getty Research Institute, Los Angeles: Painting Stock Book 6, 1911 December-1920 July, page 130, copy in NGA curatorial files; the painting was stock number 13944. Willys' name is included in a history of the painting prepared by Ross Watson, dated 18 July 1968, in NGA curatorial files. Willys was President of Willys-Overland Motors, Inc., Toledo, Ohio, and amassed a considerable art collection, part of which he later used to furnish his apartment at 820 Fifth Avenue, New York. He bought his British pictures from Agnew's and from Reinhardt & Son between 1910 and 1921; see Ralph Flint, "John N. Willys Collection," International Studio 80 (February 1925), 363-374, which does not mention this painting. M. Knoedler & Co. Records, accession number 2012.M.54, Research Library, Getty Research Institute, Los Angeles: Painting Stock Book 6, 1911 December-1920 July, page 163, copy in NGA curatorial files; the painting was stock number 14342. Arts, Industries, and Manufactures, and Loan Museum of Works of Art, National Portrait Gallery, Dublin, 1872, no. 228. Thomas Gainsborough: "The Harvest Wagon", Birmingham Museum and Art Gallery; Art Gallery of Ontario, Toronto, 1995, no. 19 (shown only in Toronto). The fairly fine canvas is plain woven; it has been lined. The ground is white, of moderate thickness. The painting is executed in thin washes that block out the composition and serve as a middle tone, followed by more heavily pigmented, richer colors, with the shading accomplished by blending wet into wet or by dragging a lightly loaded wide brush across a broad area. The final surface texture and detail is added in very fluid, rich paint. The thin, original glazes have been abraded and reglazed, and the impasto has been slightly flattened during lining. The darks have developed traction crackle. There are scattered retouchings. The natural resin varnish has not discolored. Preliminary Catalogue of Paintings and Sculpture. National Gallery of Art, Washington, 1941: 71, no. 98, as by Thomas Gainsborough. Book of Illustrations. National Gallery of Art, Washington, 1942: 241, repro. 14, as by Thomas Gainsborough. Paintings and Sculpture from the Mellon Collection. National Gallery of Art, Washington, 1949 (reprinted 1953 and 1958): 110, repro. Waterhouse, Ellis Kirkham. "Preliminary Check List of Portraits by Thomas Gainsborough." Walpole Society 33 (1953): 111. Summary Catalogue of European Paintings and Sculpture. National Gallery of Art, Washington, 1965: 54, as by Thomas Gainsborough. European Paintings and Sculpture, Illustrations. National Gallery of Art, Washington, 1968: 47, repro., as by Thomas Gainsborough. European Paintings: An Illustrated Summary Catalogue. National Gallery of Art, Washington, 1975: 144, repro. Hayes, John. British Paintings of the Sixteenth through Nineteenth Centuries. The Collections of the National Gallery of Art Systematic Catalogue. Washington, D.C., 1992: 64-66, repro. 65.